Divorce rates have been on the rise over recent years in the United States. From 2009 to 2015, the number of divorced males increased by 11.3 percent while the number of divorced females increased by 12 percent. Pansop used data collected from the United States Census Bureau to produce insights on the increased number of divorced people in the U.S. The data illustrates how divorce rates increased by nearly twice the rate of population growth. 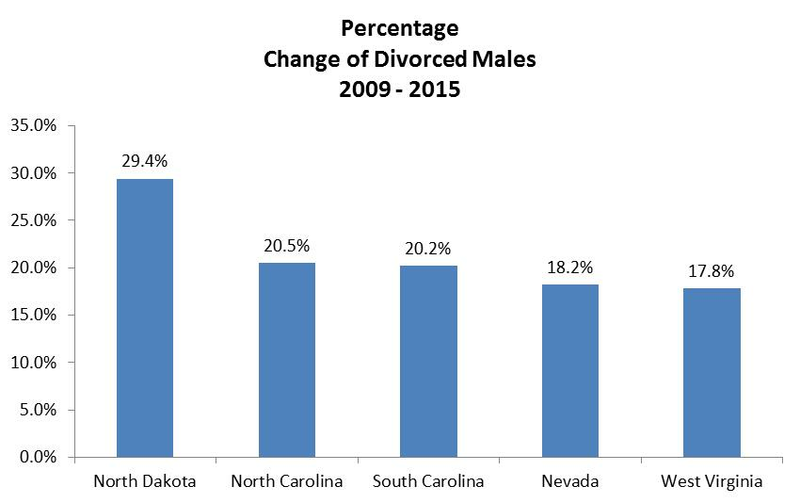 The number of divorced males expanded from 10.8 million in 2009 to 12 million in 2015. Females experienced a similar increase from approximately 14.2 million in 2009 to 16 million in 2015. One gender is able to have a different rate of change than the other because the divorce rates were calculated by comparing the difference in the number of divorced individuals for each gender. The statistics on the number of divorced individuals were broken down to state and county levels. Overall there were 5 million more divorced females than males in 2015. The number of divorced females also increased by approximately a 1 percent higher rate than males. The following table outlines the top 5 states to experience the highest increase in the number of divorced females. North Dakota, North Carolina, Florida, Delaware, and Colorado all experienced an 18 percent increase of divorced females. The top 5 states for males also included North Dakota and Delaware. The remaining states were South Carolina, Nevada, and West Virginia as seen in the following data table. Divorces commonly occur for a number of reasons but further research suggests that divorces can be impacted by income levels, education, and a lack of guidance. Overall it is most noteworthy that there was an increase of over 10 percent for each gender during the 6 year time period between 2009 and 2015.